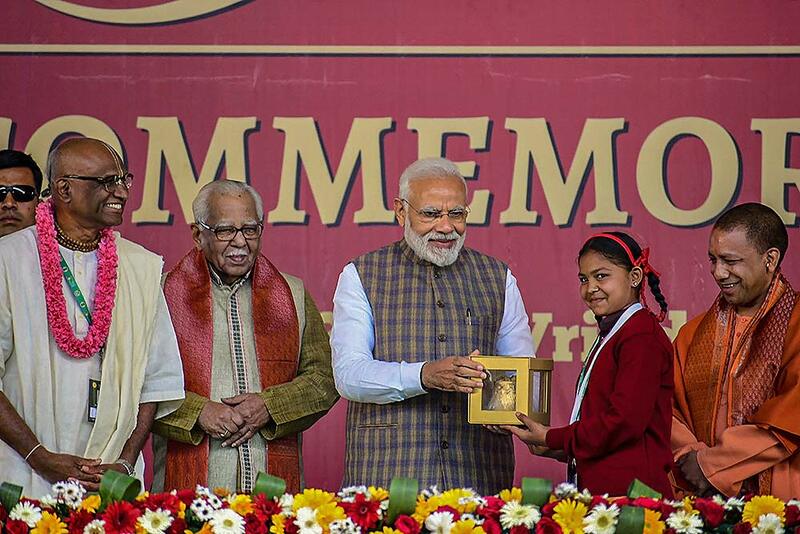 Prime Minister Narendra Modi receives a memento from a girl as UP Governor Ram Naik and Chief Minister Yogi Adityanath look on, during a programme to mark the serving of the 3rd billionth meal by the Akshaya Patra Foundation, in Vrindavan near Mathura. 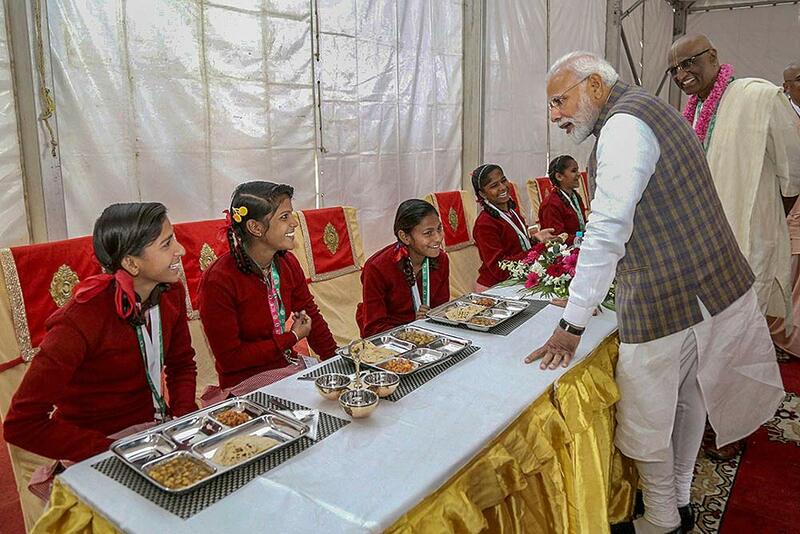 Prime Minister Narendra Modi serves food to underprivileged children during a programme organised to mark the serving of the 3rd billionth meal by the Akshaya Patra Foundation, in Vrindavan near Mathura. 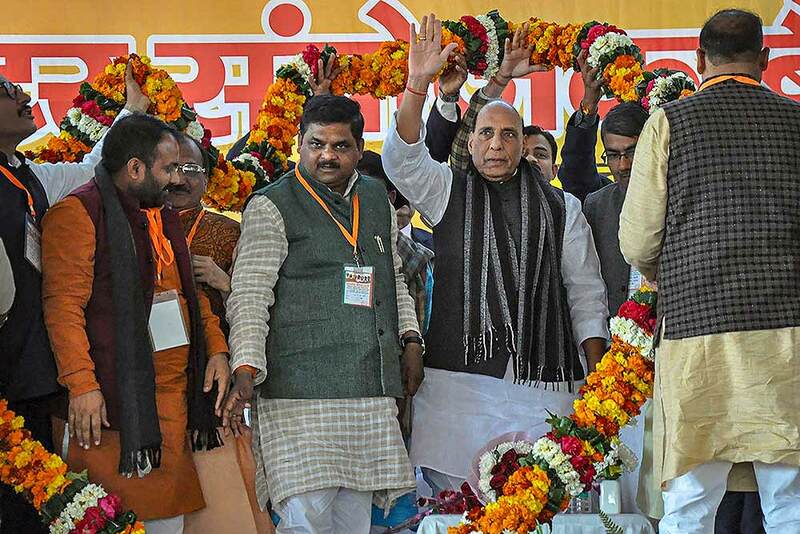 Union Home Minister Rajnath Singh being garlanded during BJP's Assembly sector coordinators meeting in Moradabad. 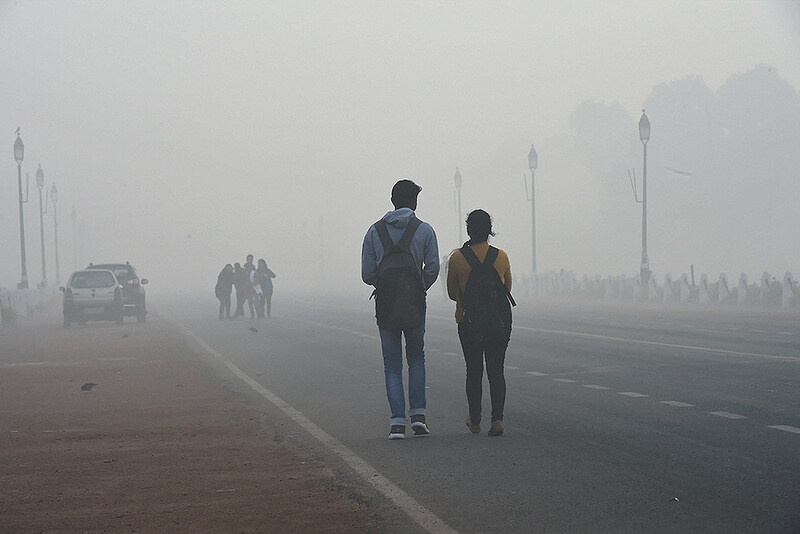 Pedestrians walk through a foggy street at Rajpath, in New Delhi. 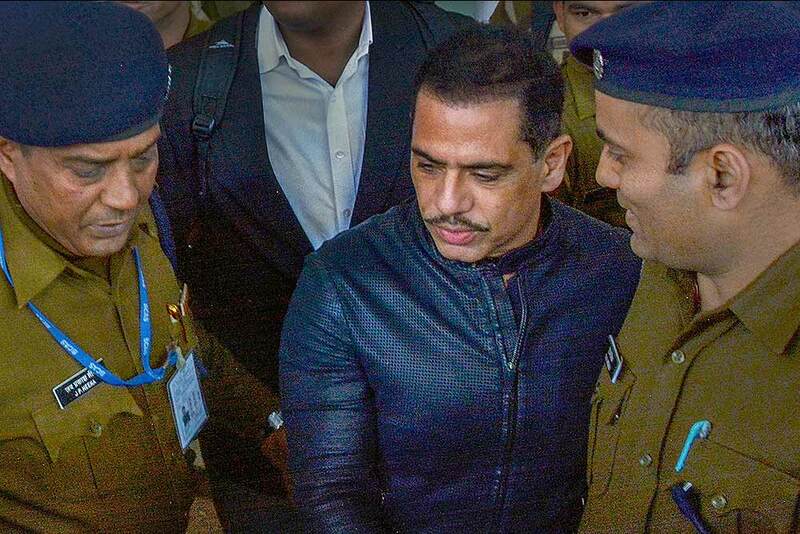 Businessman Robert Vadra arrives to appear before the Enforcement Directorate (ED) officials in connection with the alleged Bikaner land scam, at Jaipur Airport. 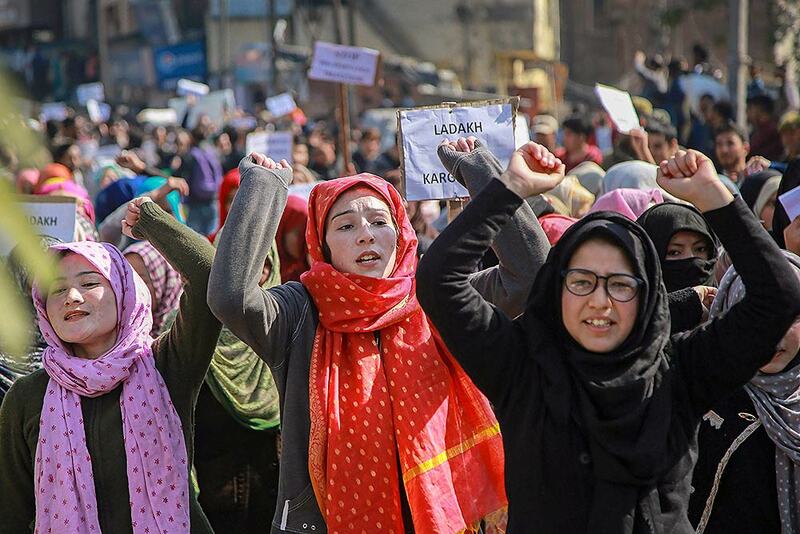 Residents of Kargil district raise slogans during a protest against Leh being made the permanent headquarters of the newly created Ladakh division, in Jammu. 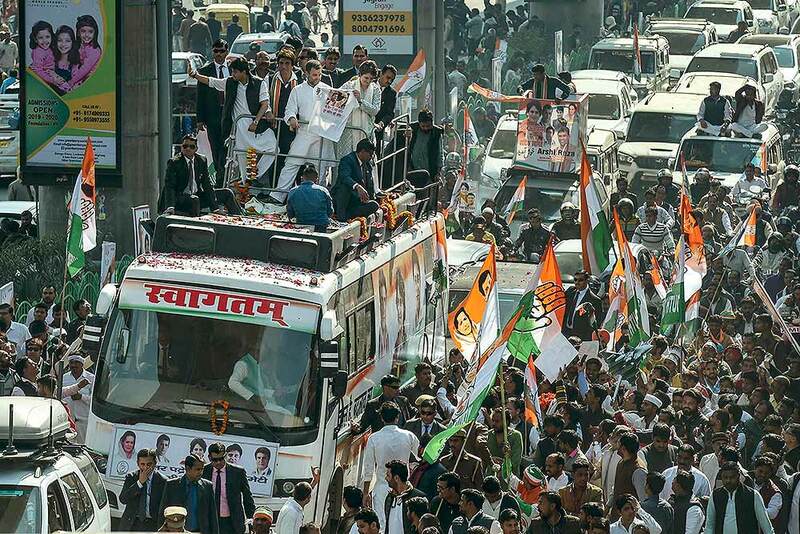 Congress President Rahul Gandhi, All India Congress Committee (AICC) General Secretaries of Uttar Pradesh (UP) East Priyanka Gandhi Vadra and UP West Jyotiraditya Madhavrao Scindia and other senior leaders during a roadshow, in Lucknow. 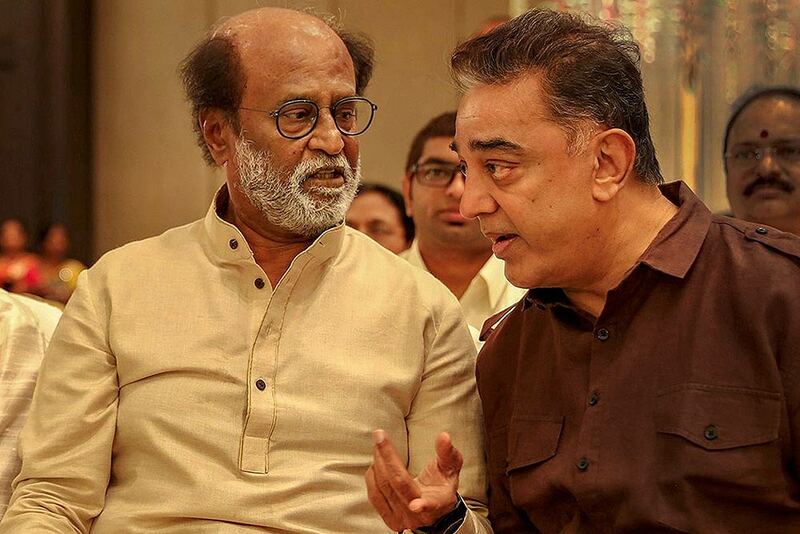 Makkal Needhi Maiam (MNM) Chief Kamal Haasan and actor-turned-politician Rajinikanth during the wedding ceremony of the latter's younger daughter Soundarya Rajinikanth with actor-businessman Vishagan Vanangamudi, in Chennai. 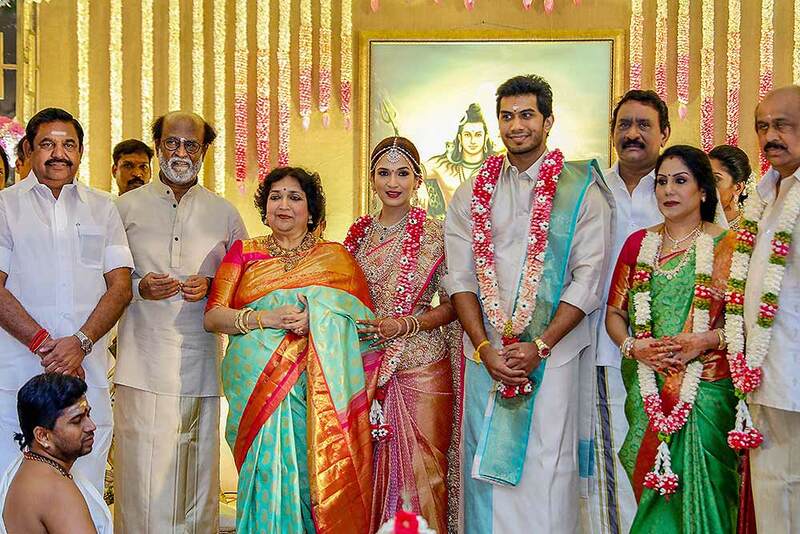 Tamil Nadu Chief Minister K Palaniswami attends the wedding ceremony of actor-turned-politician Rajinikanth's younger daughter Soundarya Rajinikanth with actor-businessman Vishagan Vanangamudi, in Chennai. 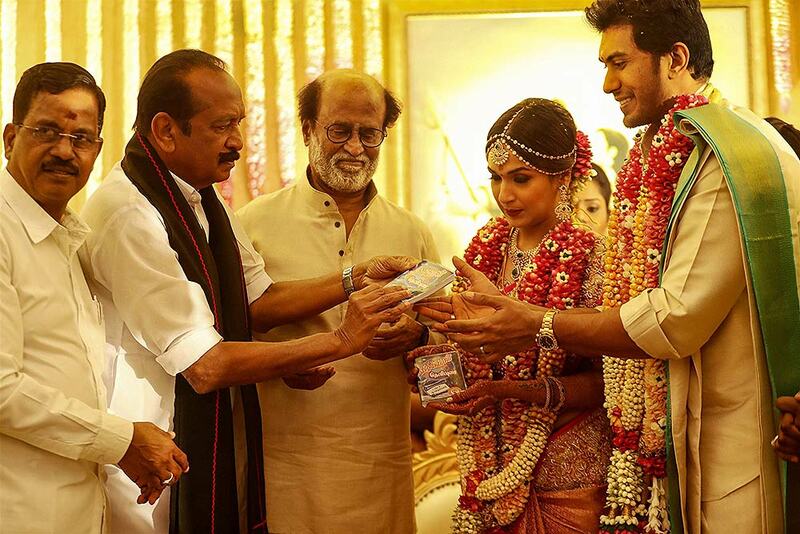 Marumalarchi Dravida Munnetra Kazhagam (MDMK) Chief Vaiko presents a gift to superstar Rajinikanth's younger daughter Soundarya Rajinikanth and actor-businessman Vishagan Vanangamudi during their wedding ceremony, in Chennai. 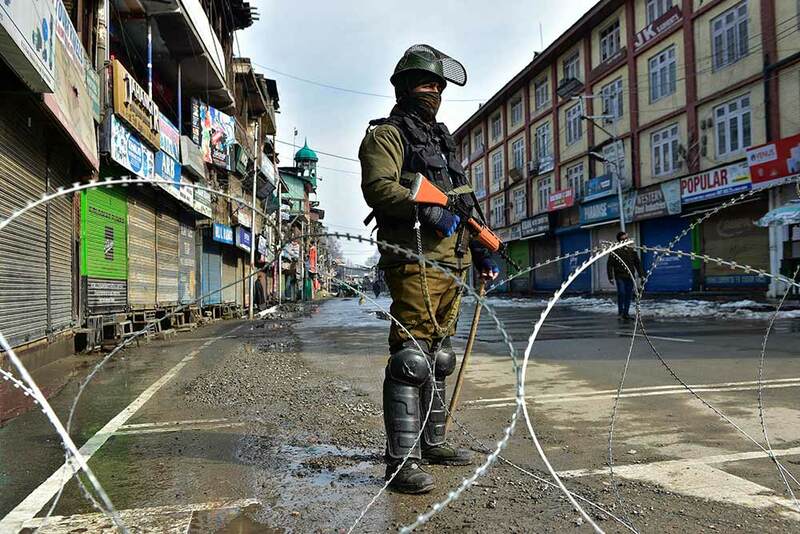 Security personnel stands guard along a barbed wire during a strike called by separatist leaders to mark the 35th death anniversary of Jammu and Kashmir Liberation Front (JKLF) founder Mohammad Maqbool Bhat, in Srinagar. 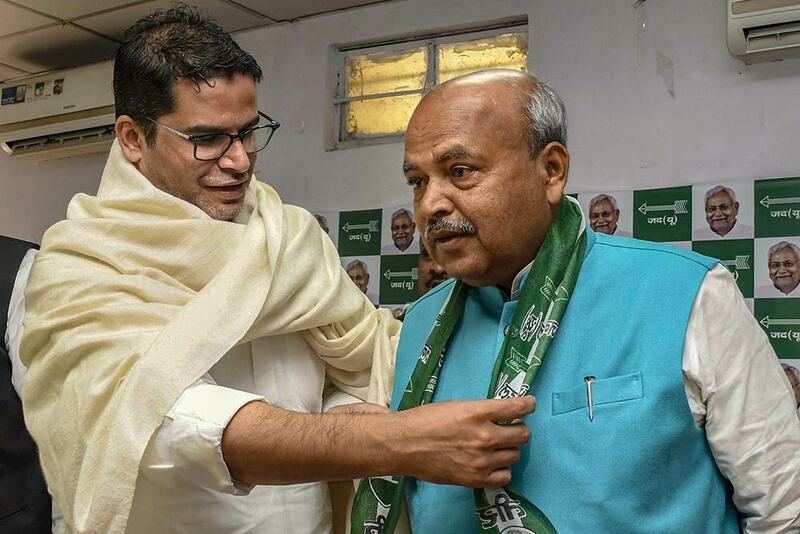 Independent MLA Ashok Choudhry is felicitated by election strategist and Janata Dal (United) leader Prashant Kishor after joining JD(U) at party office, in Patna. 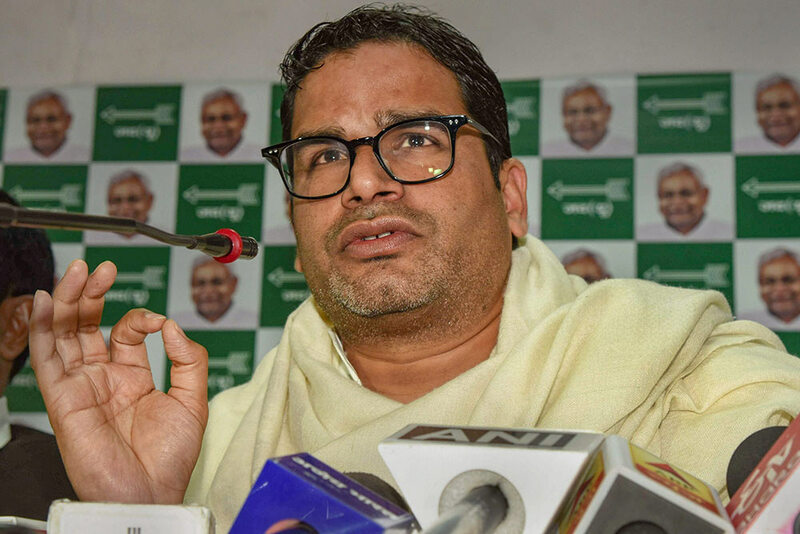 Election strategist and JDU leader Prashant Kishor addresses a press conference at his party office, in Patna. 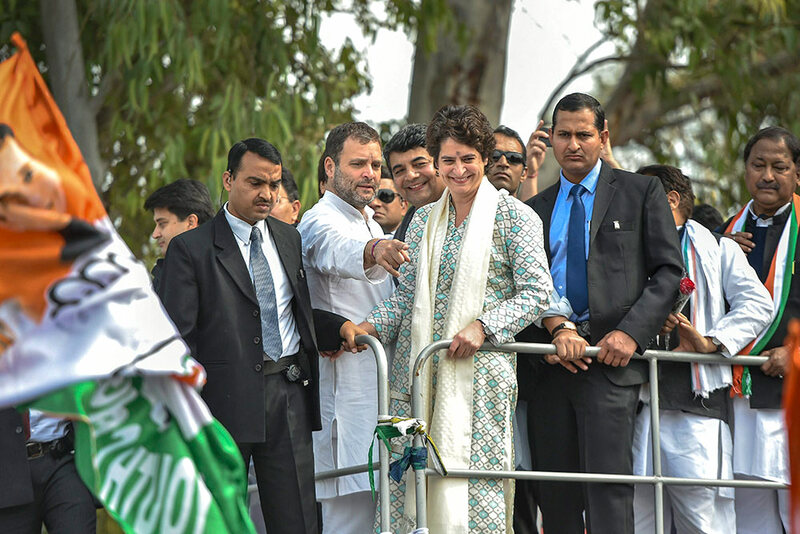 Congress President Rahul Gandhi and All India Congress Committee (AICC) General Secretary of Uttar Pradesh East, Priyanka Gandhi Vadra, during a roadshow, in Lucknow. 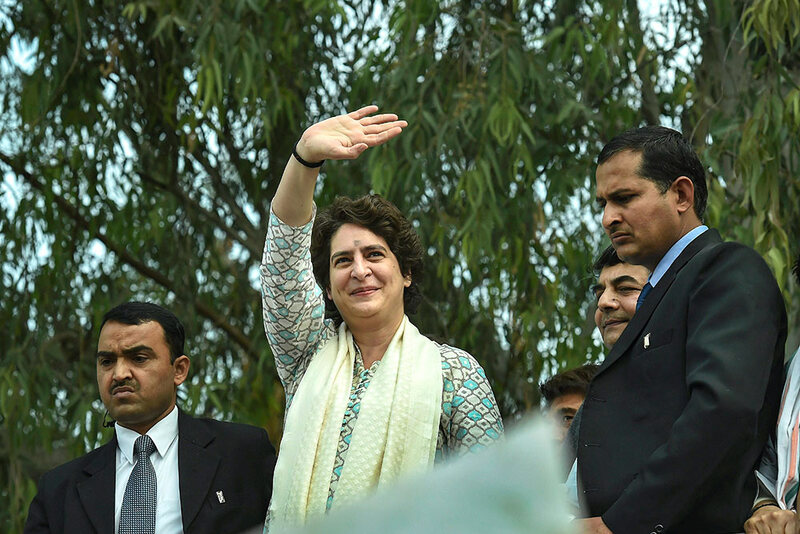 All India Congress Committee (AICC) General Secretary of Uttar Pradesh East, Priyanka Gandhi Vadra, during a roadshow, in Lucknow. 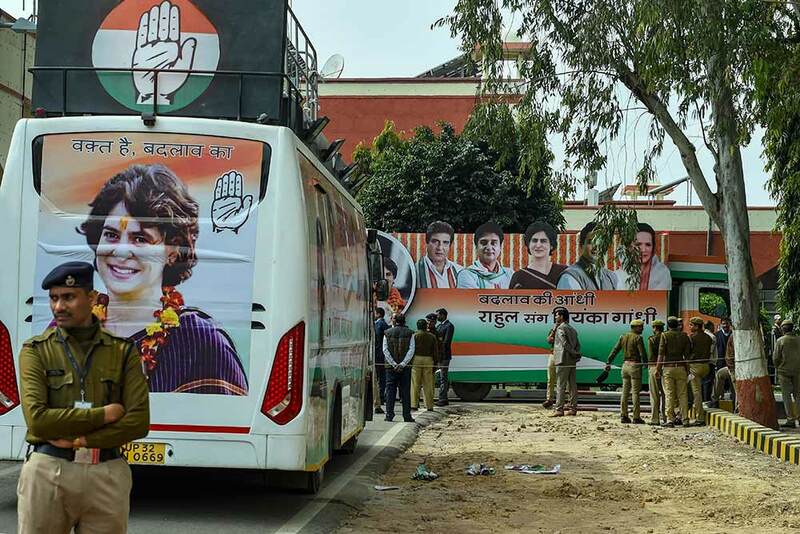 Security personnel stand guard as All India Congress Committee (AICC) General Secretary of Uttar Pradesh East, Priyanka Gandhi Vadra (unseen) arrives for a roadshow, in Lucknow. 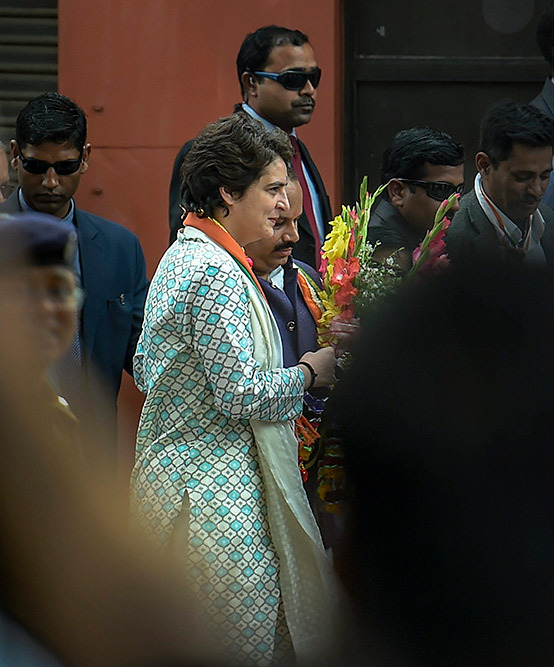 All India Congress Committee (AICC) General Secretary of Uttar Pradesh East, Priyanka Gandhi Vadra, arrives for a roadshow, in Lucknow. 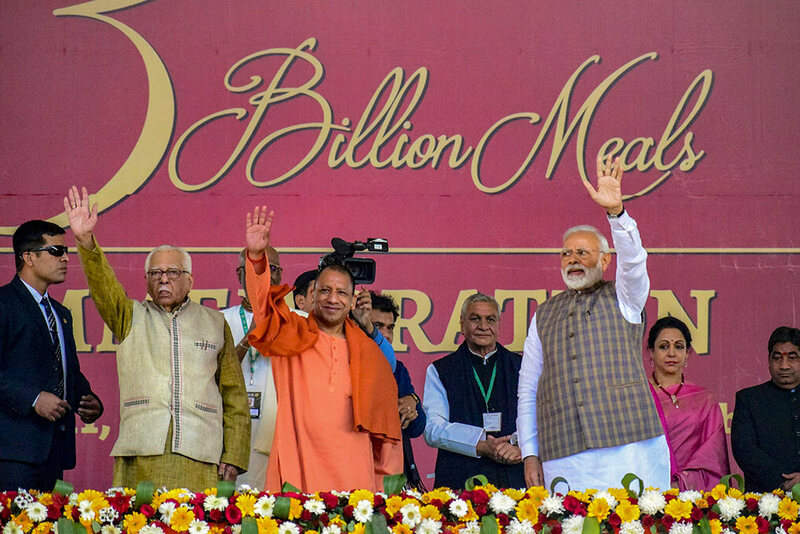 Prime Minister Narendra Modi, Uttar Pradesh Chief Minister Yogi Adityanath, Governor Ram Naik, BJP MP Hema Malini and others during the unveiling of a ceremonial plaque to mark the serving of '3rd billionth meal' at Vrindavan Chandrodaya Mandir campus, at Vrindavan in Mathura district. 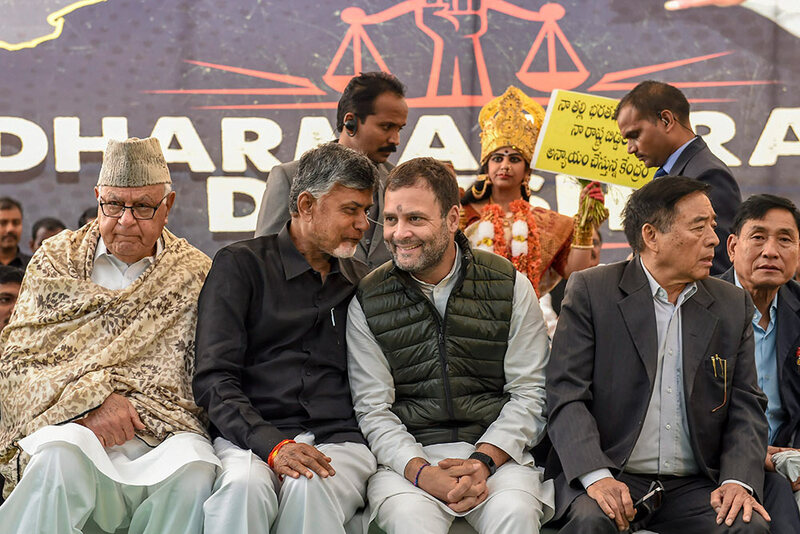 Congress President Rahul Gandhi, National Conference President Farooq Abdullah and Andhra Pradesh Chief Minister Chandrababu Naidu during 'Dharma Porata Deeksha', a day-long fast to demand special status for the state of Andhra Pradesh, in New Delhi. 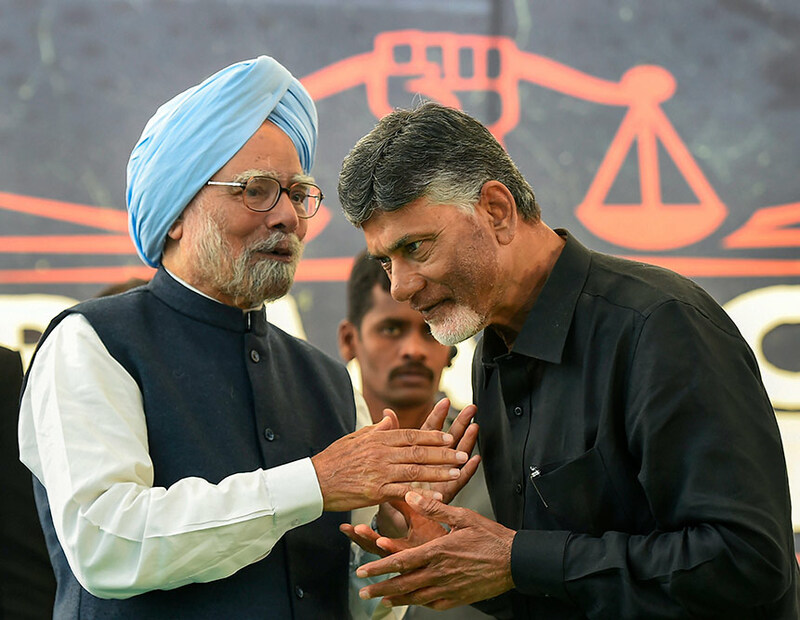 Former prime minister Manmohan Singh and Andhra Pradesh Chief Minister Chandrababu Naidu during 'Dharma Porata Deeksha', a day-long fast to demand special status for the state of Andhra Pradesh, in New Delhi. 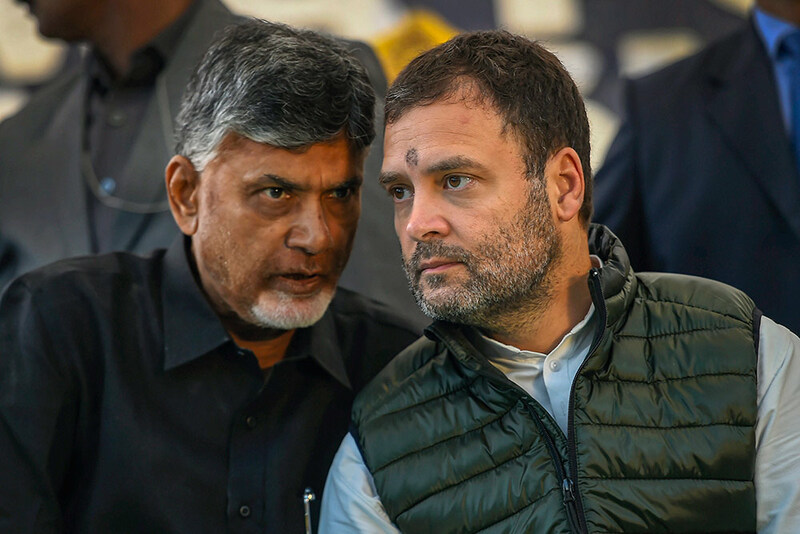 Congress President Rahul Gandhi and Andhra Pradesh Chief Minister Chandrababu Naidu during 'Dharma Porata Deeksha', a day-long fast to demand special status for the state of Andhra Pradesh, in New Delhi. 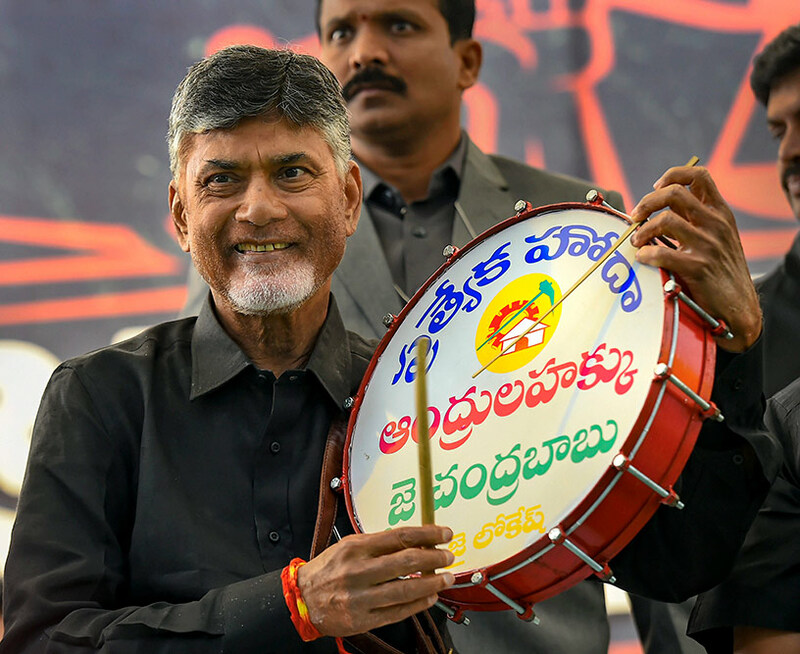 Andhra Pradesh Chief Minister Chandrababu Naidu during 'Dharma Porata Deeksha', a day-long fast to demand special status for the state of Andhra Pradesh, in New Delhi. 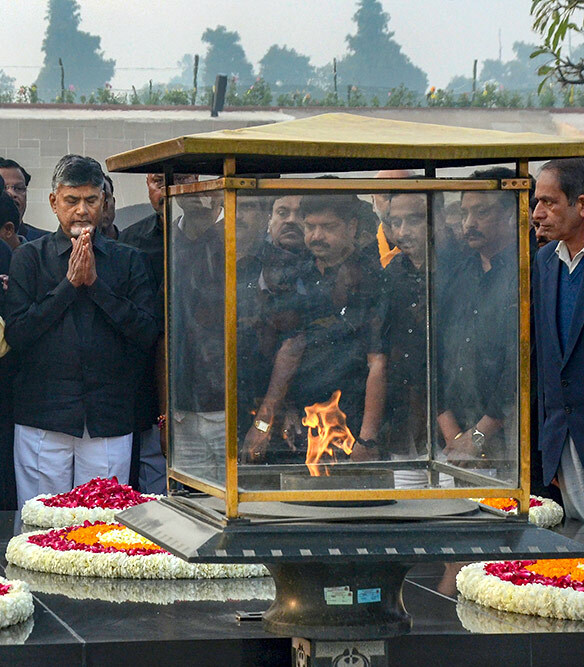 Andhra Pradesh Chief Minister Chandrababu Naidu pays homage to Mahatma Gandhi before beginning a day-long fast to demand special status for the state of Andhra Pradesh, at Raj Ghat in New Delhi. 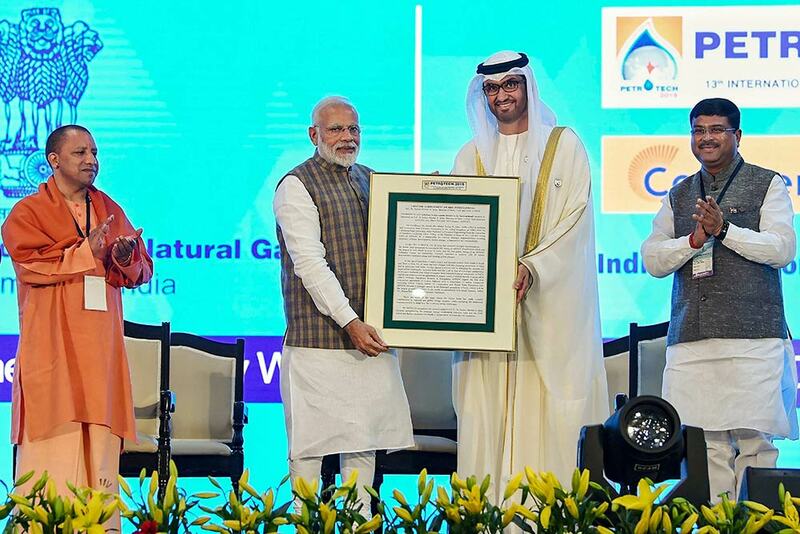 Prime Minister Narendra Modi, UAE’s minister of state and ADNOC CEO Sultan Ahmed Al Jaber, Uttar Pradesh Chief Minister Yogi Adityanath and Union Petroleum and Natural Gas Minister Dharmendra Pradhana during the inauguration of 13th International Oil and Gas Conference - PETROTECH 2019 at India Expo Centre, at Greater Noida. 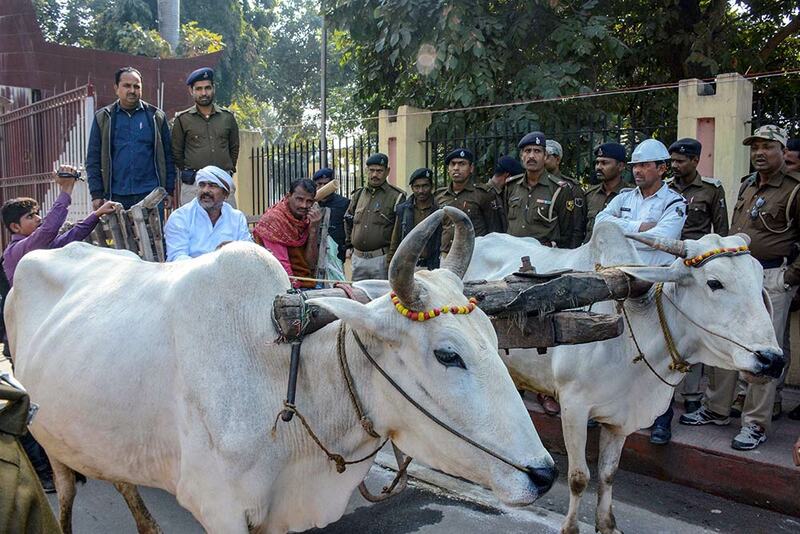 Congress legislator from Sitamarhi Amit Kumar Tunna arrive at Bihar Assembly on a bullock cart on the first-day of Budget Session 2019-20, in Patna. 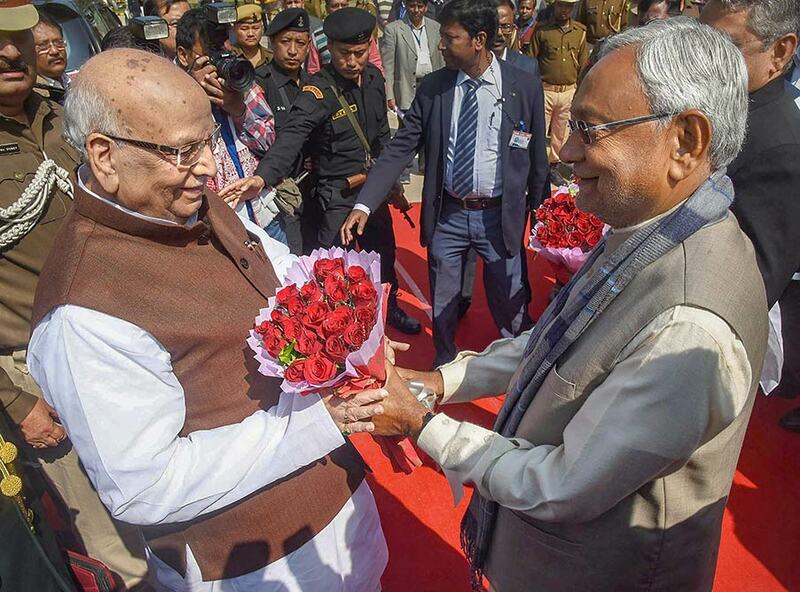 Bihar Chief Minister Nitish Kumar greets Bihar Governor Lalji Tandon during a joint session of Bihar Assembly on the first day of Budget Session, in Patna. 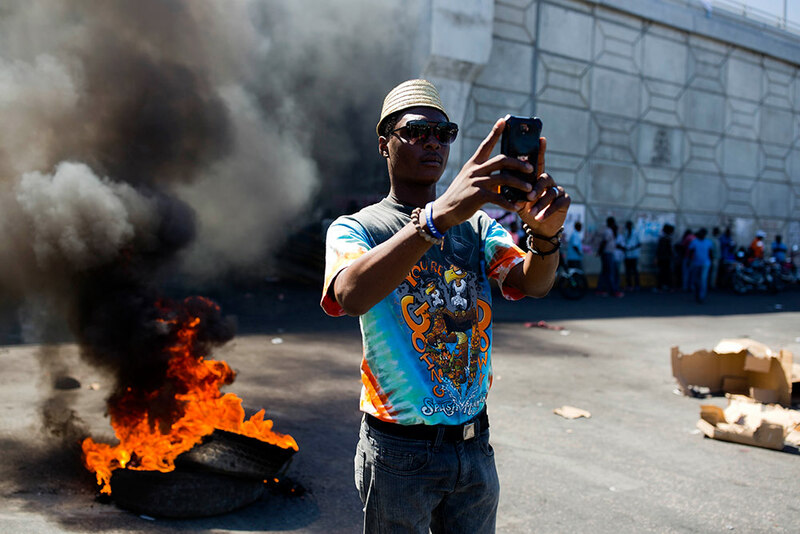 A demonstrator takes a selfie in front of a burning barricade during a protest demanding the resignation of President Jovenel Moise in Port-au-Prince, Haiti. 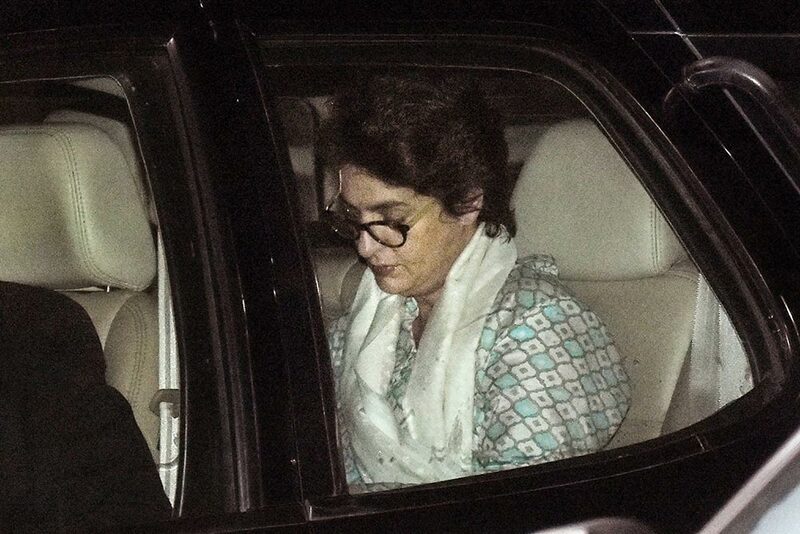 Protesters are angry about skyrocketing inflation and the government's failure to prosecute embezzlement from a multi-billion Venezuelan program that sent discounted oil to Haiti. 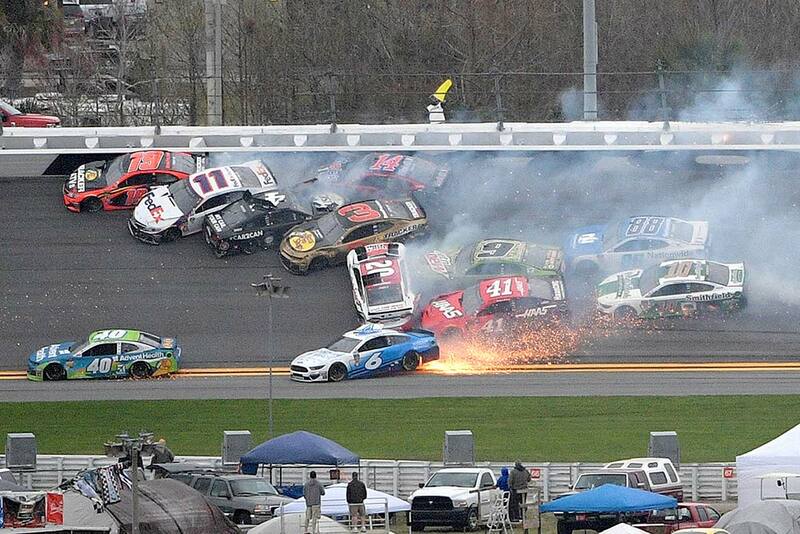 Martin Truex Jr. (19), Denny Hamlin (11), Kevin Harvick (4), Austin Dillon (3), Clint Bowyer (14), Erik Jones (20), Chase Elliott (9), Daniel Suarez (41), Ryan Newman (6), Alex Bowman (88) and Aric Almirola (10) are involved in a multi-car pileup during the NASCAR Clash auto race at Daytona International Speedway in Daytona Beach, Florida. 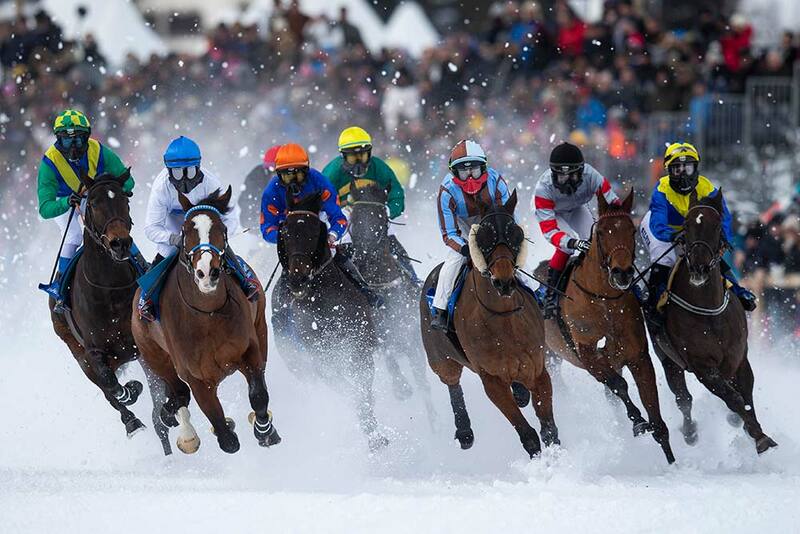 Raphael Lingg on Filou, second from left, is on his way to win the GP Christoffel Bau Trophy, on the frozen lake on the second weekend of the White Turf races in St. Moritz, Switzerland. 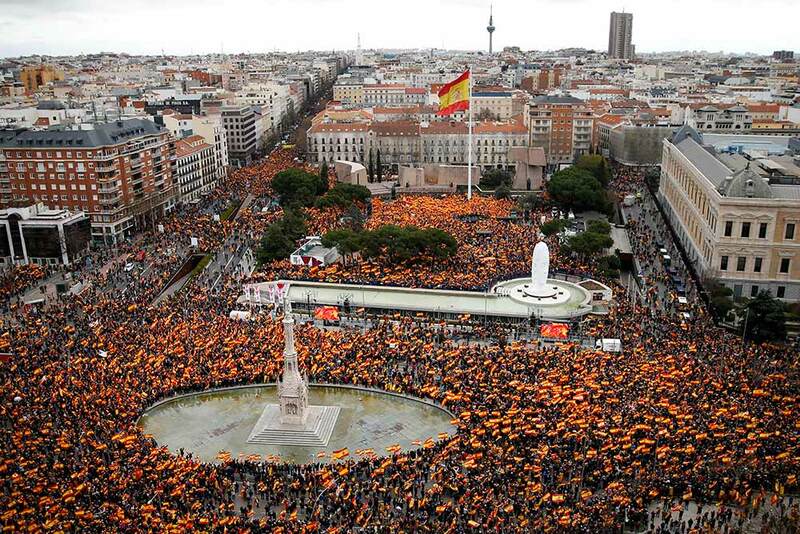 Thousands of demonstrators hold Spanish flags during a protest in Madrid, Spain. 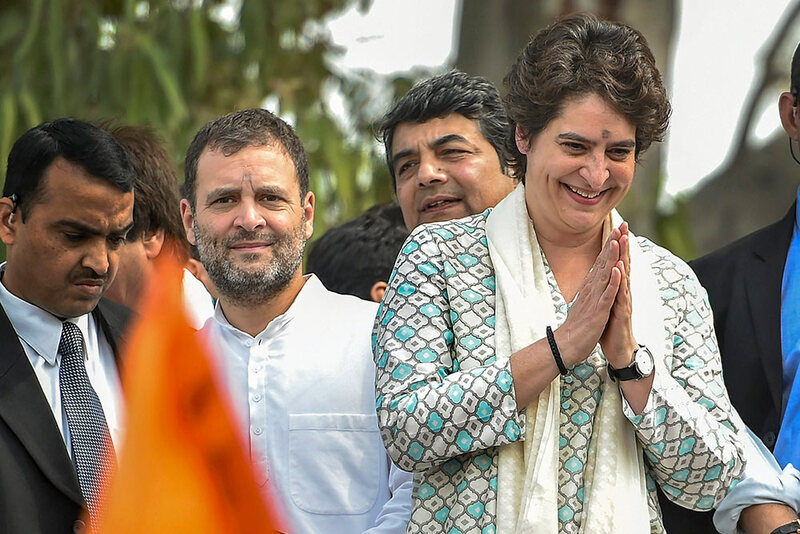 Thousands of Spaniards in Madrid are joining a rally called by right-wing political parties to demand that Socialist Prime Minister Pedro Sanchez step down. 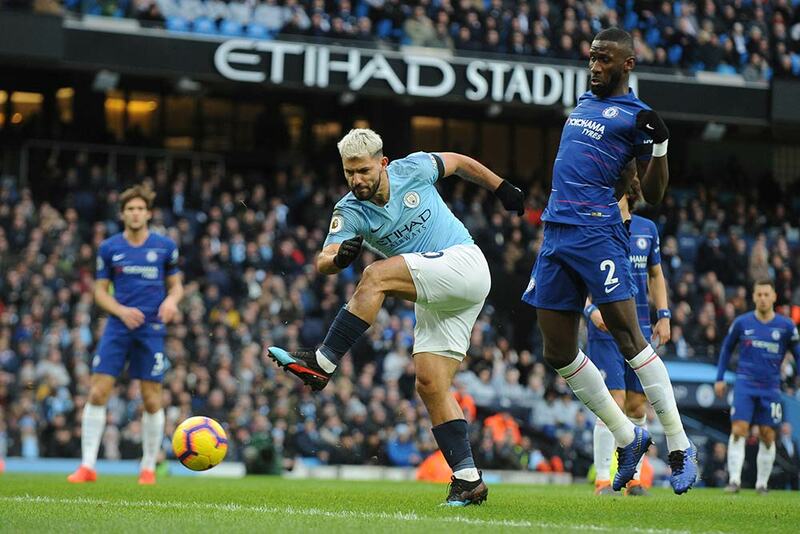 Manchester City's Sergio Aguero scores his side's third goal during the English Premier League soccer match between Manchester City and Chelsea at Etihad stadium in Manchester, England. 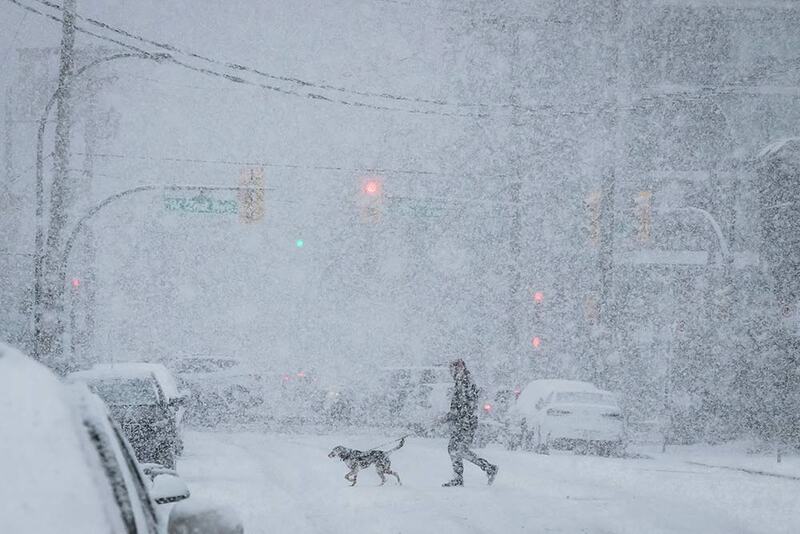 A person walks a dog as heavy snow falls in Vancouver. Environment Canada issued a snowfall warning for Metro Vancouver with five to 10 centimeters expected in the region. 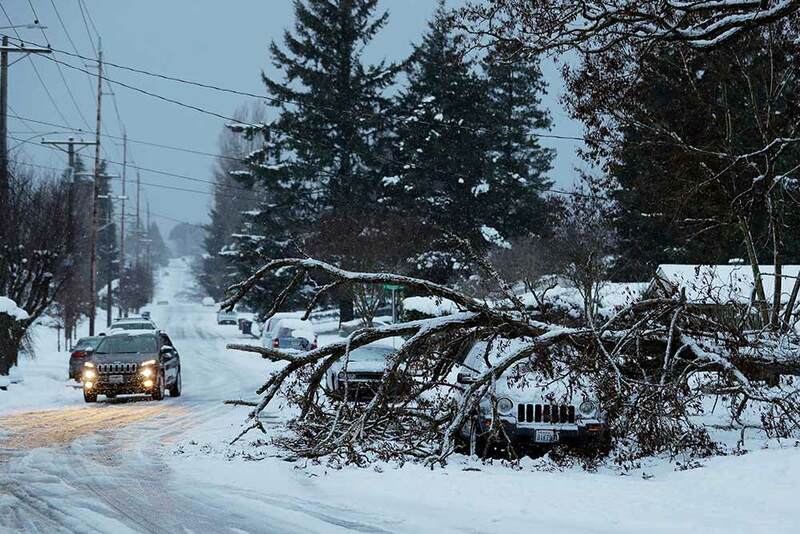 A tree rests on a vehicle on a residential street in Tacoma, Washington. Pacific Northwest residents who are more accustomed to rain than snow were digging out from a big winter storm over the weekend and bracing for more snow forecast. 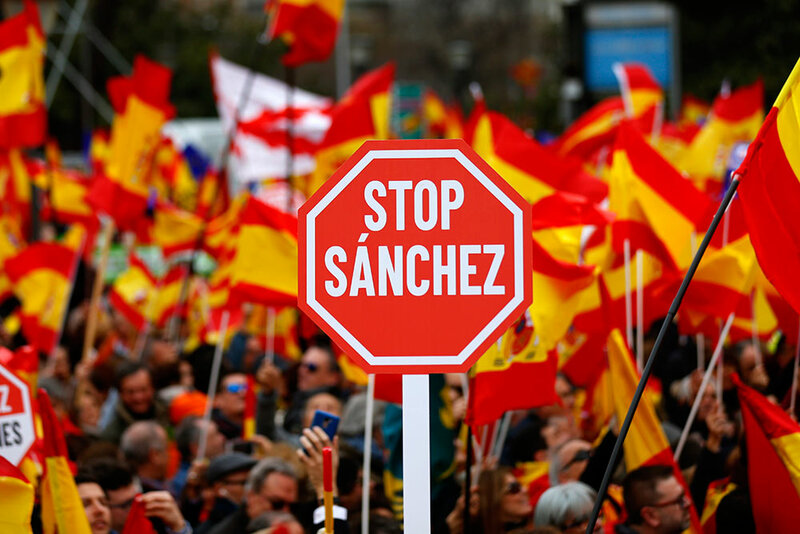 Demonstrators hold banners and Spanish flags during a protest in Madrid, Spain. 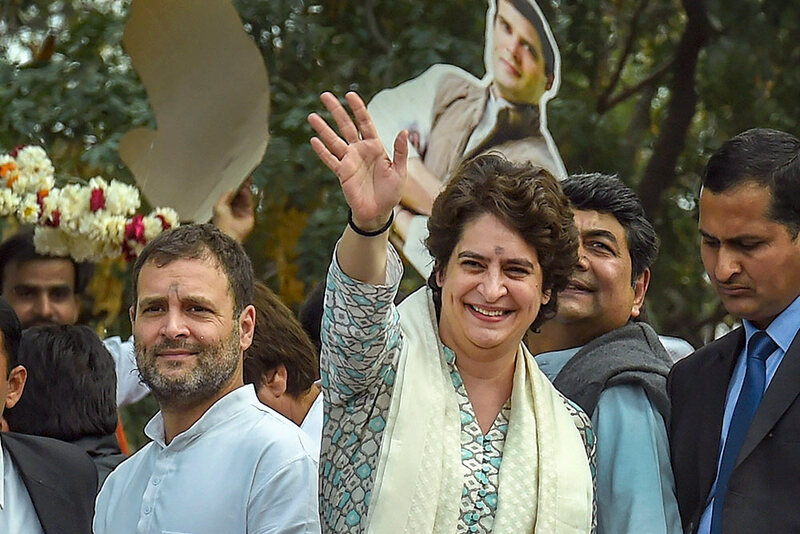 Thousands of Spaniards in Madrid are joining a rally called by right-wing political parties to demand that Socialist Prime Minister Pedro Sanchez step down. 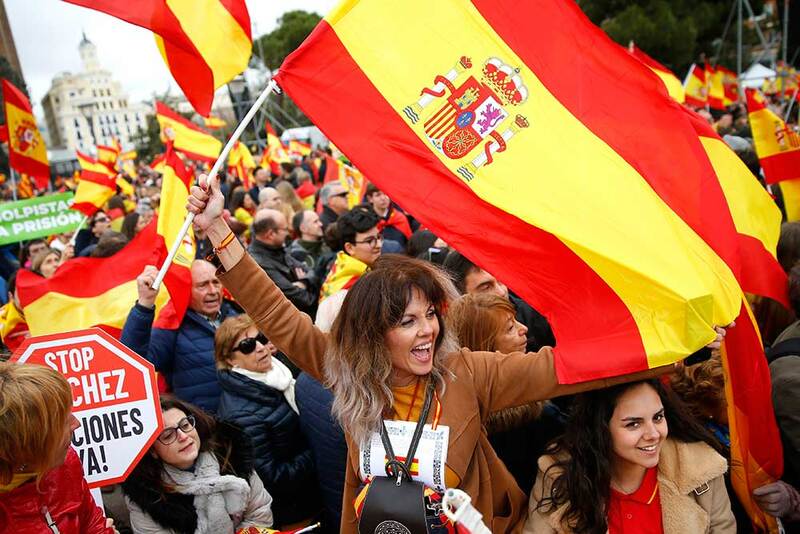 Demonstrators wave Spanish flags during a protest in Madrid, Spain. Banner reads in Spanish "coup leaders must go to the prison". 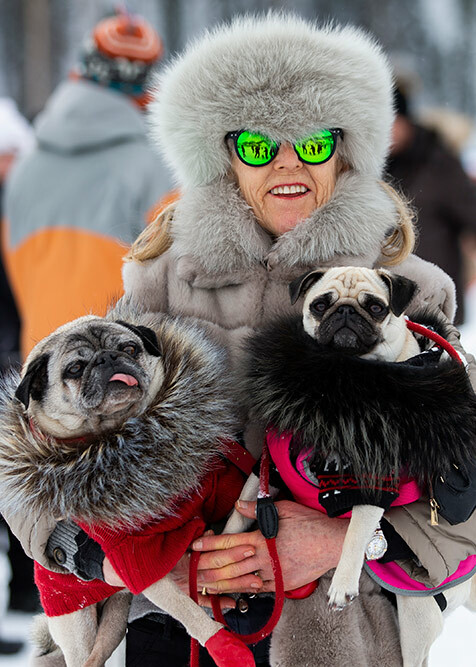 Silvia from Jersey poses with her dogs Charles, left, and Camilla, right, on the frozen lake on the second weekend of the White Turf races in St. Moritz, Switzerland. 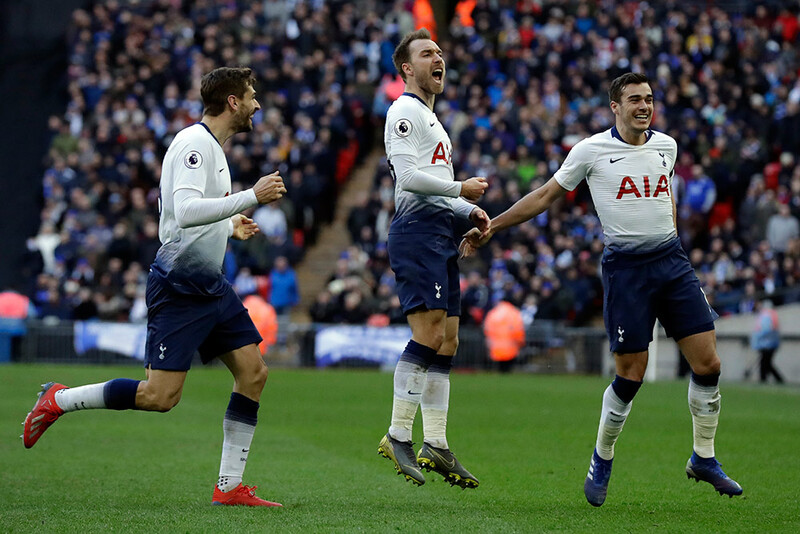 Tottenham Hotspur's Christian Eriksen, center, celebrates after scoring his side's second goal during the English Premier League soccer match between Tottenham Hotspur and Leicester City at Wembley stadium in London. 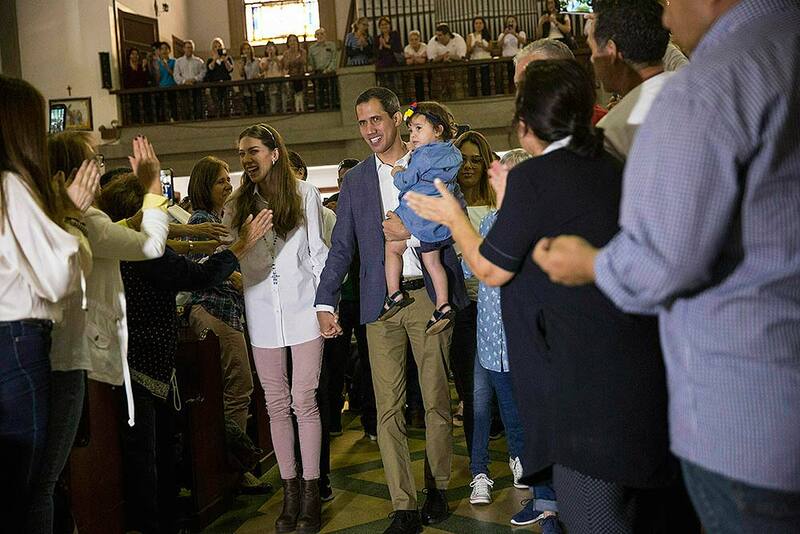 National Assembly President Juan Guaido, who declared himself interim president of Venezuela, stands next to his wife Fabiana Rosales, left, as he holds his daughter Miranda in a church in Caracas, Venezuela. Host Alicia Keys speaks at the 61st annual Grammy Awards in Los Angeles. 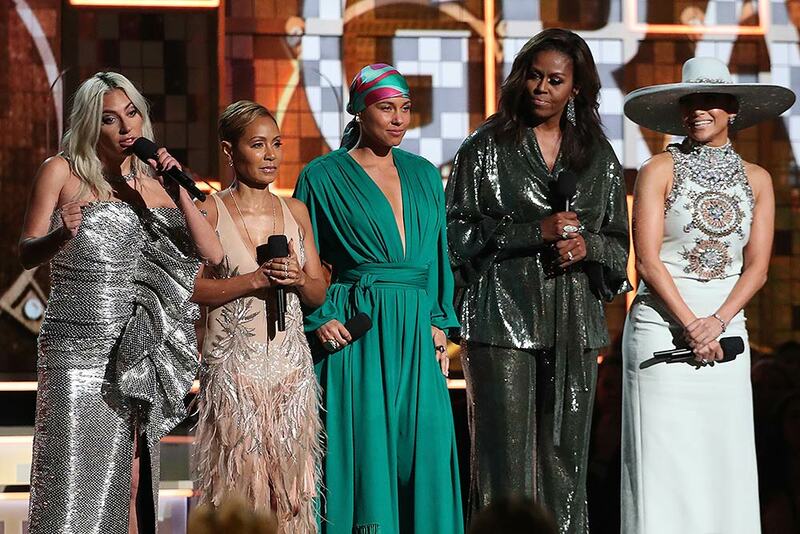 Lady Gaga, from left, Jada Pinkett Smith, Alicia Keys, Michelle Obama and Jennifer Lopez speak at the 61st annual Grammy Awards in Los Angeles. 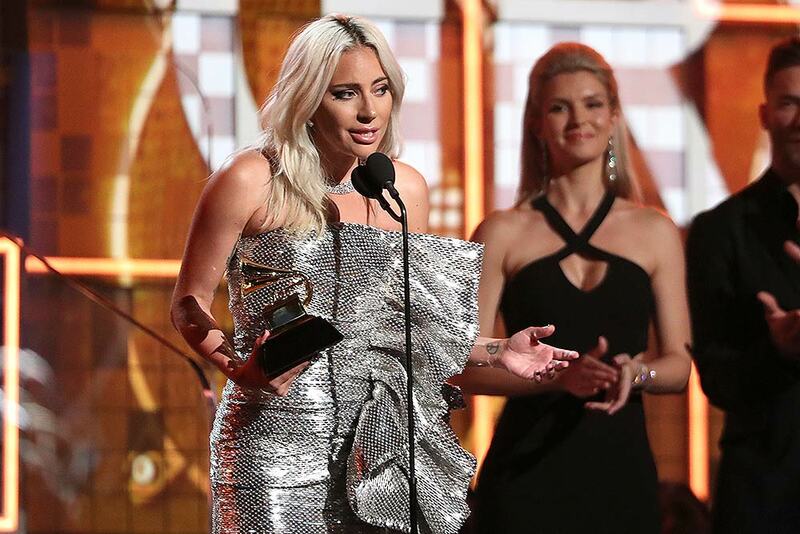 Lady Gaga accept the award for best pop duo or group performance for "Shallow" at the 61st annual Grammy Awards in Los Angeles. 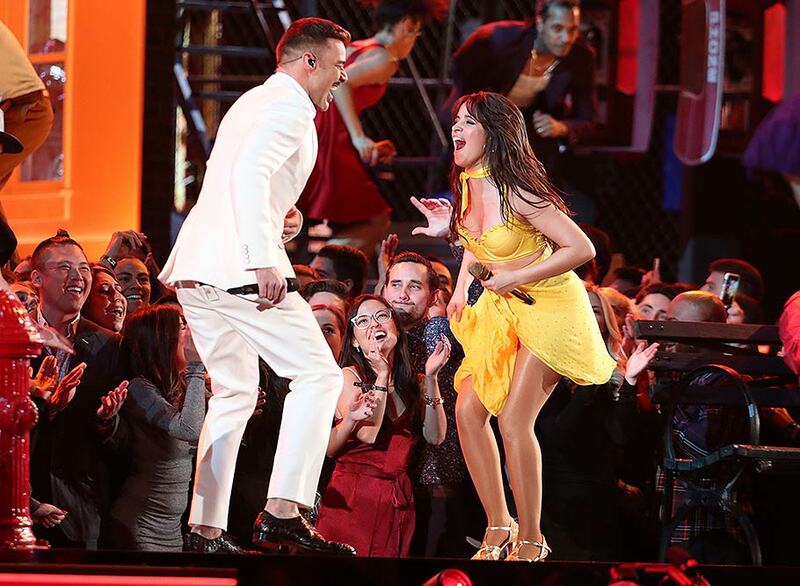 Ricky Martin, left, and Camila Cabello perform "Havana" at the 61st annual Grammy Awards in Los Angeles. 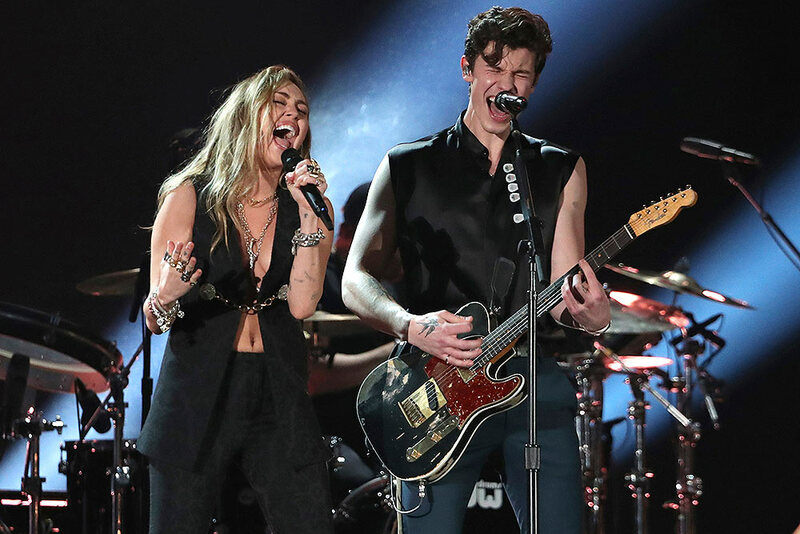 Miley Cyrus, left, and Shawn Mendes perform "In My Blood" at the 61st annual Grammy Awards in Los Angeles. Joelle James poses in the press room with the award for best R&B song for "Boo'd Up" at the 61st annual Grammy Awards at the Staples Center in Los Angeles. 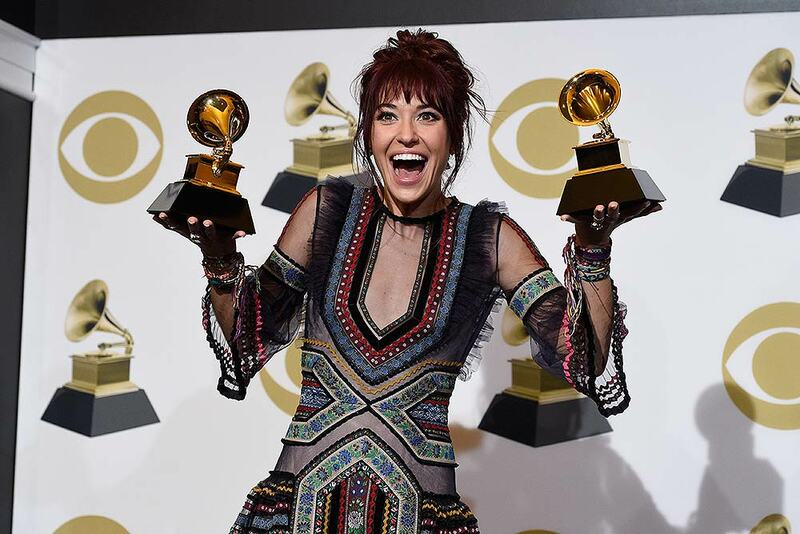 Laura Daigle poses in the press room with the awards for best contemporary christian music performance/song for "You Say" and best contemporary christian music album for "Look Up Child" at the 61st annual Grammy Awards at the Staples Center in Los Angeles. 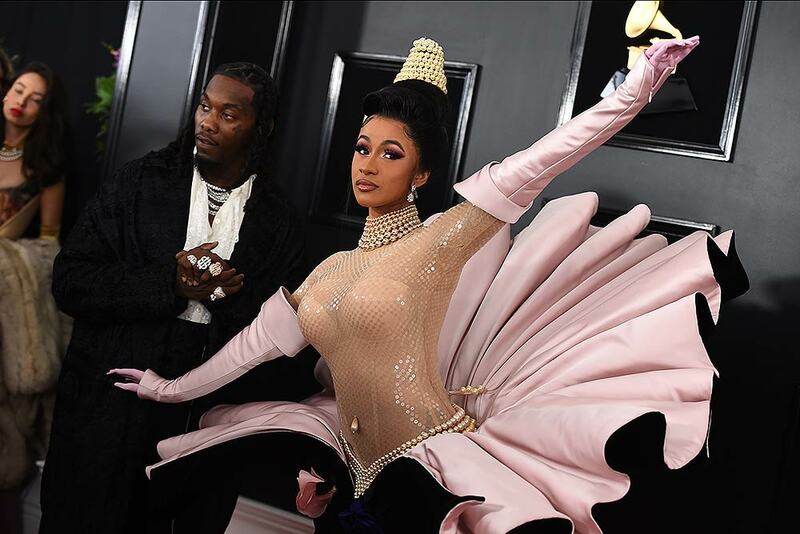 Offset, left, and Cardi B arrive at the 61st annual Grammy Awards at the Staples Center in Los Angeles. Cardi B performs "Money" at the 61st annual Grammy Awards in Los Angeles. 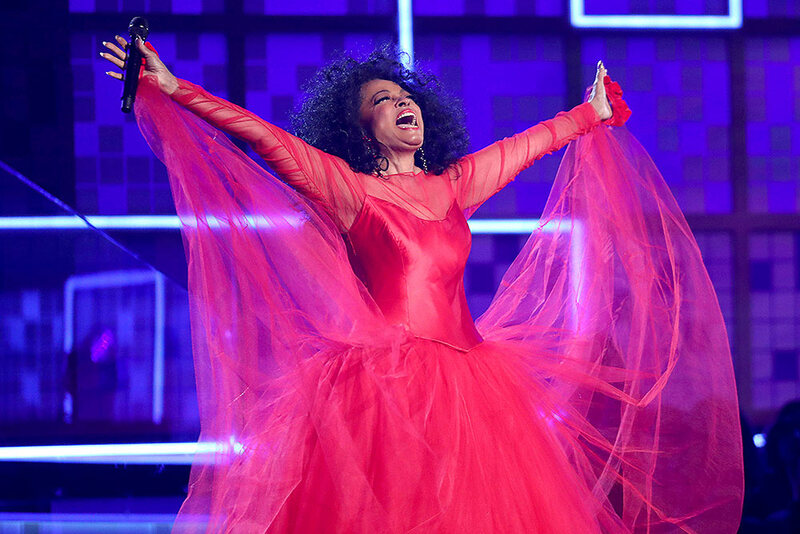 Diana Ross performs a medley at the 61st annual Grammy Awards in Los Angeles. 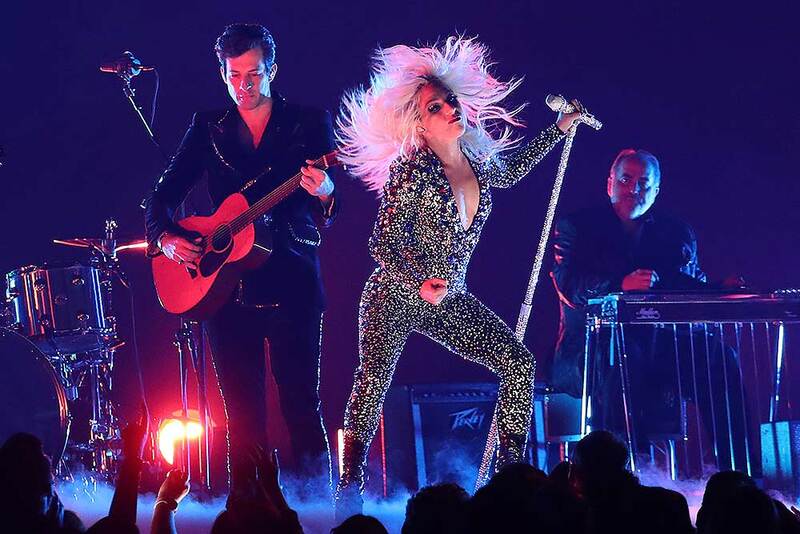 Lady Gaga, right, and Mark Ronson perform "Shallow" at the 61st annual Grammy Awards in Los Angeles. Jennifer Lopez performs a medley during a tribute to Motown's 60th anniversary at the 61st annual Grammy Awards in Los Angeles. 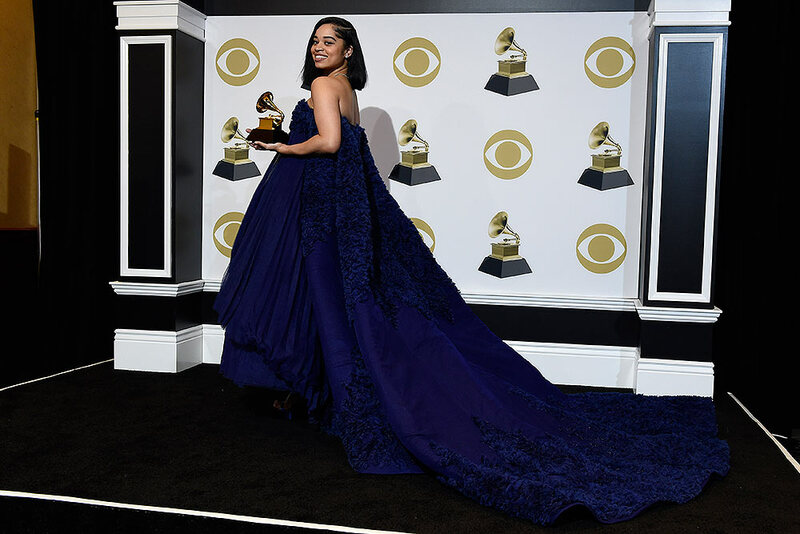 Ella Mai poses in the press room with the award for best R&B song for "Boo'd Up" at the 61st annual Grammy Awards at the Staples Center in Los Angeles. 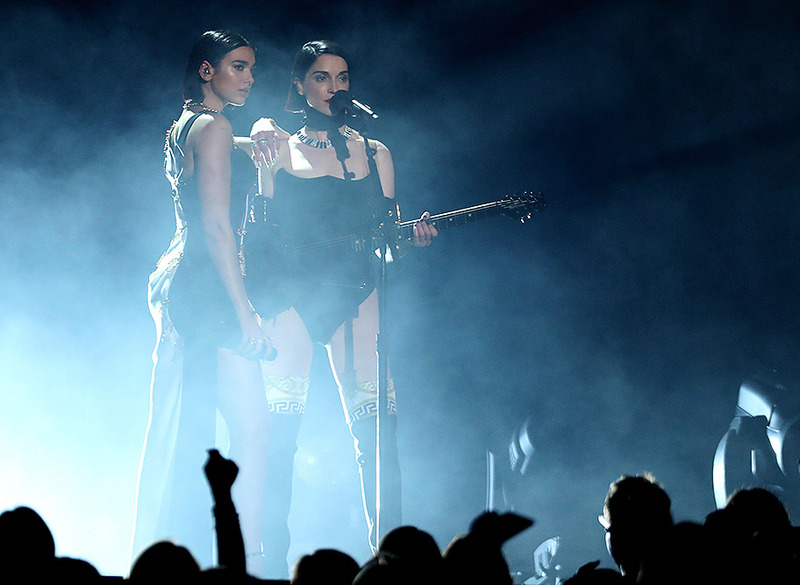 Dua Lipa, left, and St. Vincent perform a medley at the 61st annual Grammy Awards in Los Angeles. 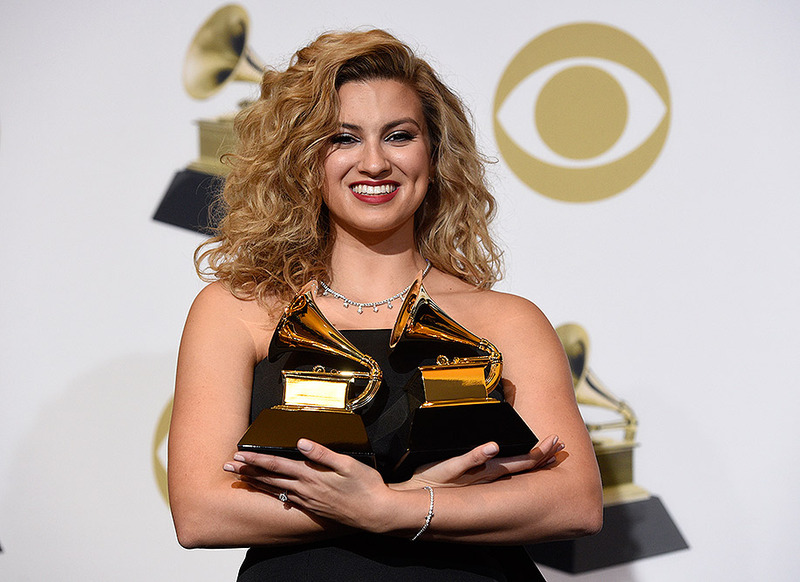 Tori Kelly poses in the press room with the awards for best gospel performance/song for "Never Alone" and best gospel album for "Hiding Place" at the 61st annual Grammy Awards at the Staples Center in Los Angeles. 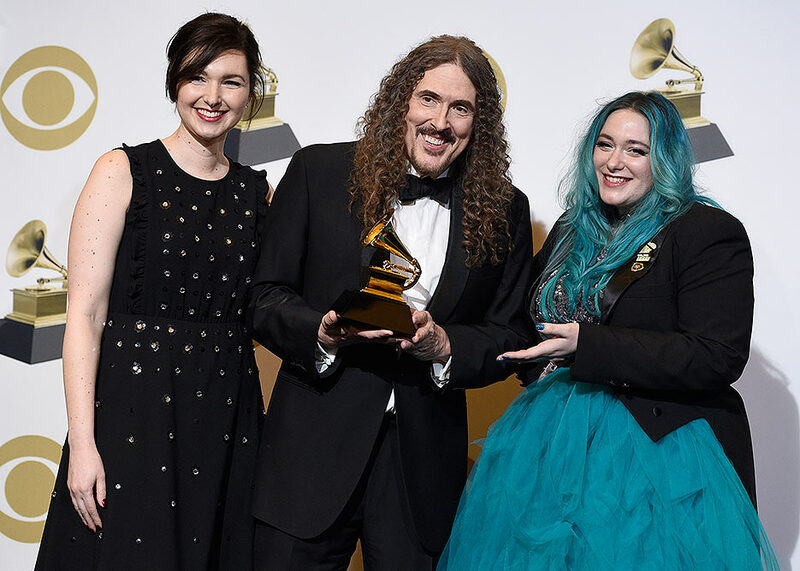 Meghan Foley, from left, "Weird Al" Yankovic and Annie Stoll pose in the press room with the award for best boxed or special limited edition package for "Squeeze Box: The Complete Works of 'Weird Al' Yankovic" at the 61st annual Grammy Awards at the Staples Center in Los Angeles. Bebe Rexha arrives at the 61st annual Grammy Awards at the Staples Center in Los Angeles. Travis Scott, center, climbs a cage during a performance at the 61st annual Grammy Awards in Los Angeles. Katy Perry, from left, Dolly Parton and Kacey Musgraves perform "Here You Come Again" at the 61st annual Grammy Awards in Los Angeles. 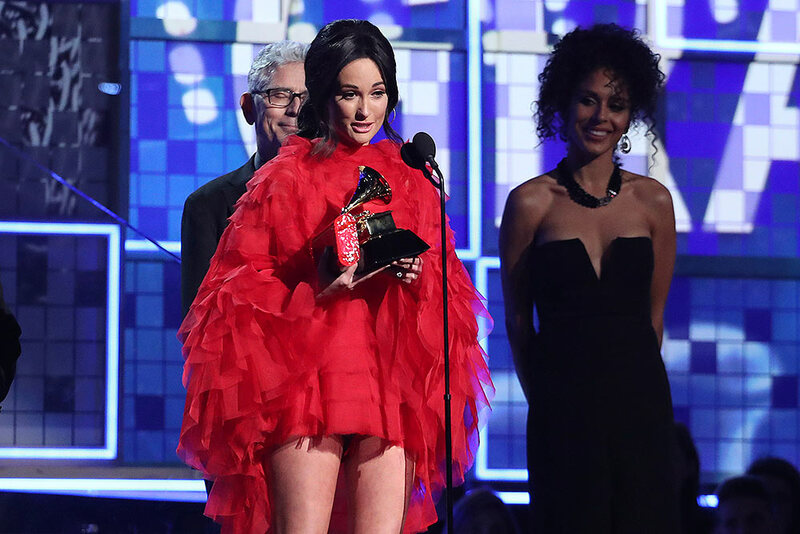 Kacey Musgraves accepts the award for album of the year for "Golden Hour" at the 61st annual Grammy Awards in Los Angeles. 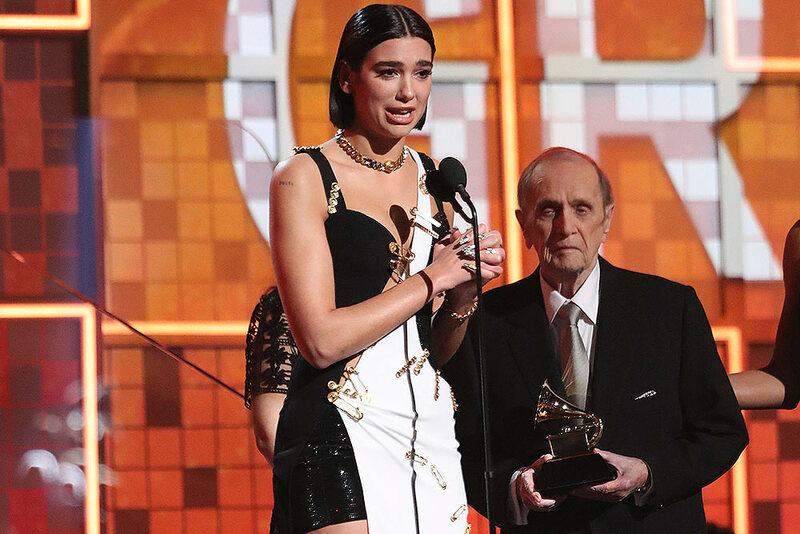 Dua Lipa accepts the award for best new artist at the 61st annual Grammy Awards in Los Angeles. Looking on at right is presenter Bob Newhart. Anna Kendrick introduces a performance by Dolly Parton at the 61st annual Grammy Awards in Los Angeles. 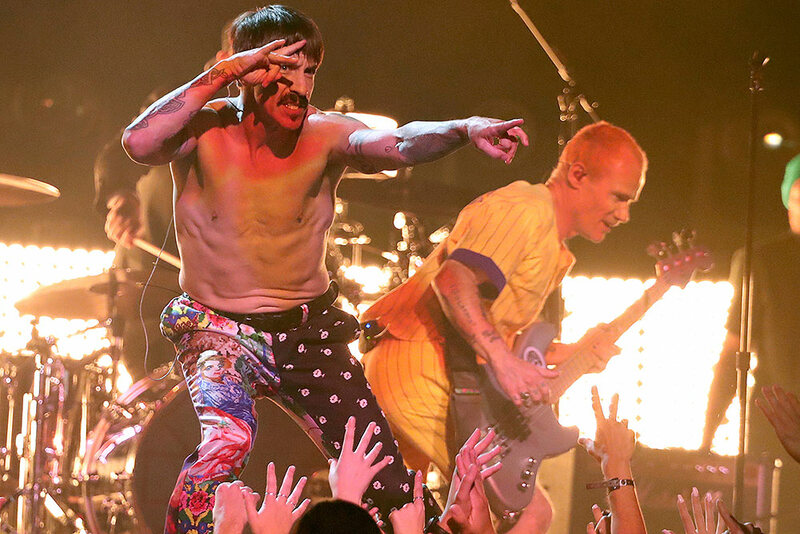 Anthony Kiedis, left, and Flea, of Red Hot Chili Peppers, perform a medley at the 61st annual Grammy Awards in Los Angeles. 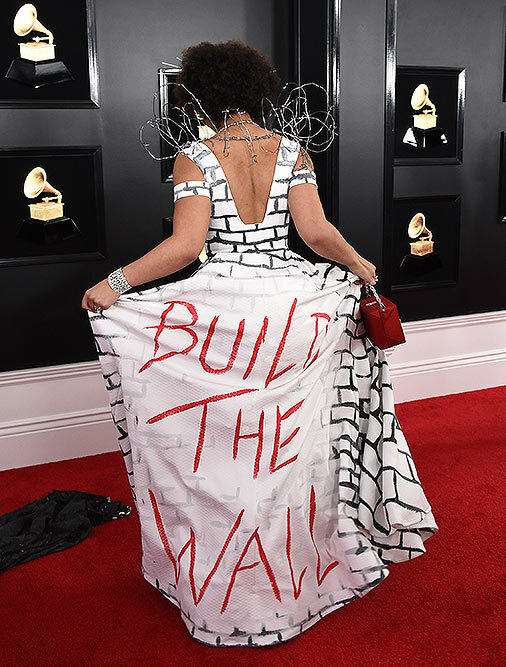 Joy Villa arrives at the 61st annual Grammy Awards at the Staples Center wearing a dress that reads "Build the Wall" in Los Angeles. 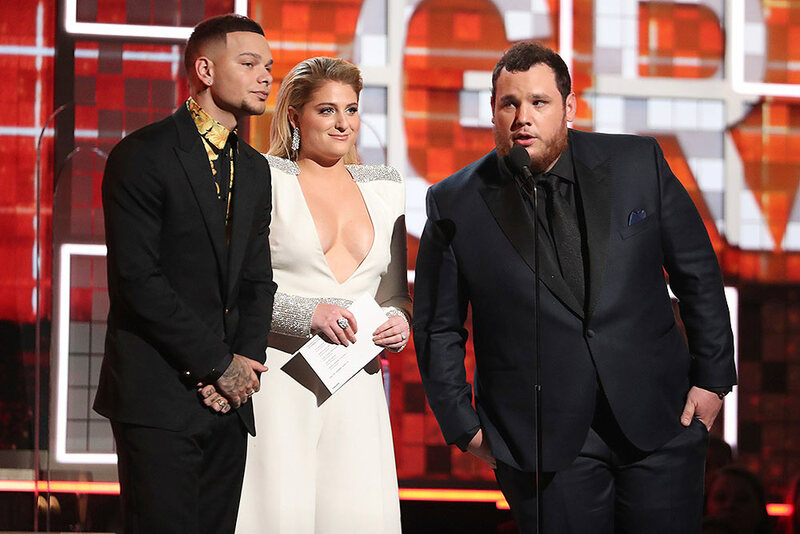 Kane Brown, from left, Meghan Trainor and Luke Combs present the award for best country album at the 61st annual Grammy Awards in Los Angeles. Travis Scott, left, and Kylie Jenner arrive at the 61st annual Grammy Awards at the Staples Center in Los Angeles. Margo Price arrives at the 61st annual Grammy Awards at the Staples Center in Los Angeles. 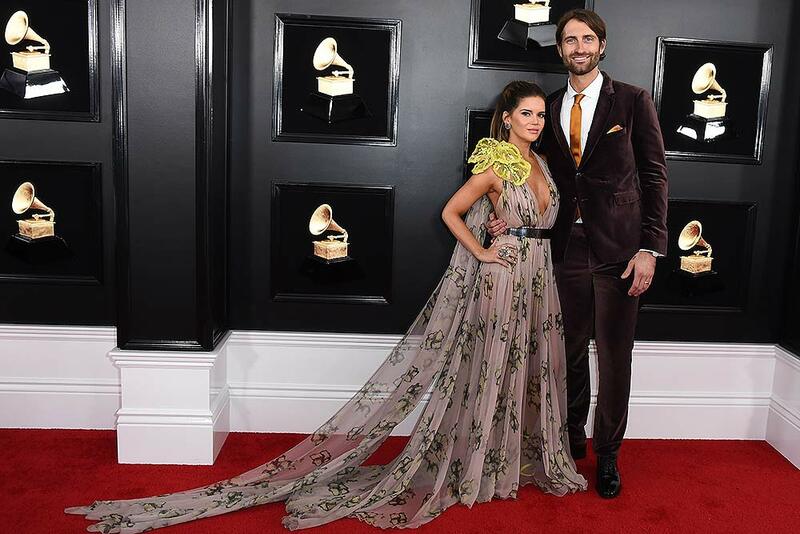 Maren Morris, left, and Ryan Hurd arrive at the 61st annual Grammy Awards at the Staples Center in Los Angeles. 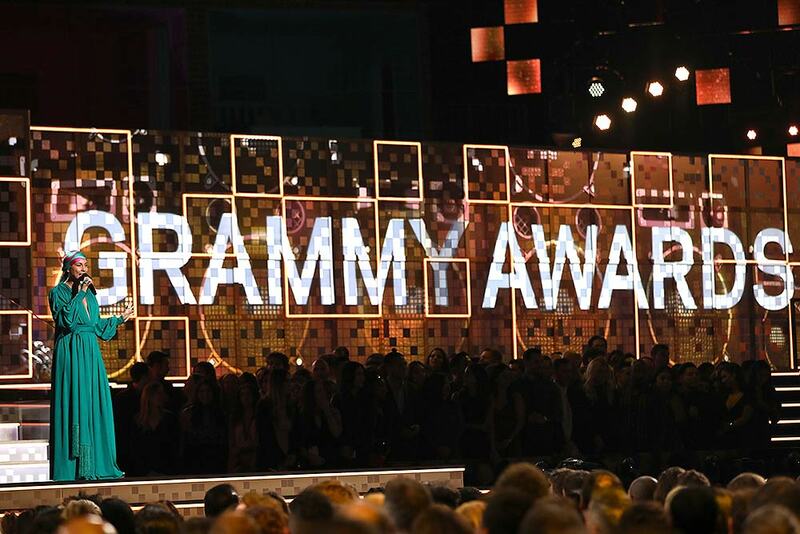 Saint Heart arrives at the 61st annual Grammy Awards at the Staples Center in Los Angeles. 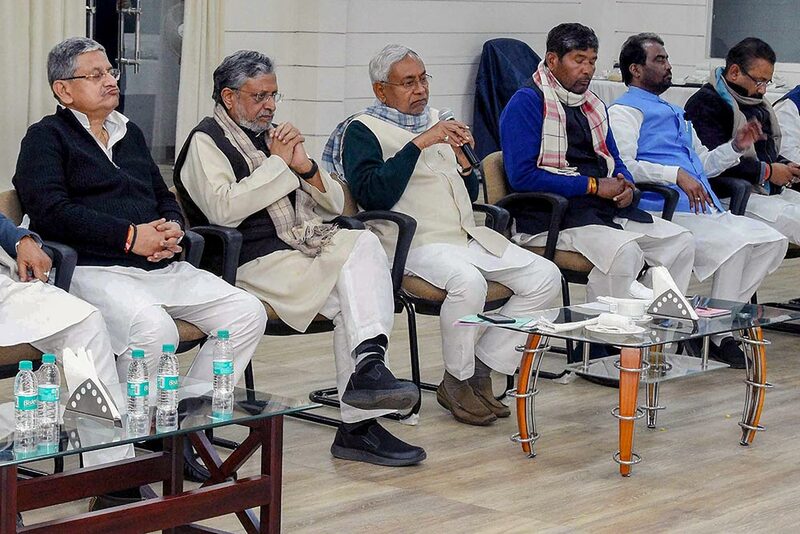 Bihar Chief Minister Nitish Kumar and Deputy CM Sushil Kumar Modi in a meeting with the state NDA legislators regarding the Budget in Patna. 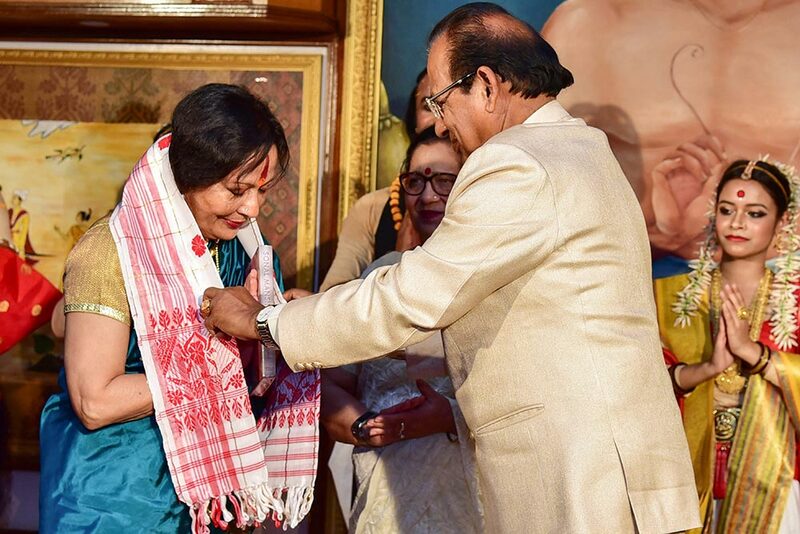 Renowned classical dancer and Rajya Sabha member Sonal Mansingh being feliciated by Assam Governor Prof. Jagdish Mukhi after dance performance in Guwahati.